NOTICE: Activation key must be used on a valid Steam account. Requires internet connection. ABOUT THE GAMEGuilt is a chilling feeling…	Originally released in 2005, Fahrenheit (known as Indigo Prophecy in North America) was a breakthrough in interactive narrative, teetering between the worlds of cinema and gaming while also embracing them, carving its own unique genre in the e… ntertainment landscape. This newly remastered edition features updated graphics, full controller support AND is based on the uncut/uncensored international version of the game. 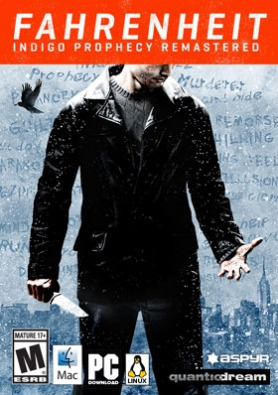 With a rich multilayered narrative, innovative presentation, and a chilling musical score by famed Hollywood composer Angelo Badalementi, Fahrenheit: Indigo Prophecy Remastered serves as the definitive version of the supernatural murder mystery and (re)introduces the groundbreaking title to old and new fans alike. KEY FEATURES Interactive Drama — An intuitive control scheme and spectacular split-screen presentation complement the game's mysterious noir narrative. Extensive Replayability — With branching dialog and multiple endings, each playthrough of the game yields a different outcome. Multiple Characters — Take control of the narrative through four different playable characters, each illuminating a different perspective of the story. Fully Voiced Script — Every line from the extensive script is voiced by professional actors in English, French, German, and Spanish. Cinematic Score — Fahrenheit features a fully orchestrated [check] score composed by Angelo Badalamenti, famous for his extensive work with director David Lynch. Uncut version of the game — Unlike the original North American release, Remastered contains all of the game's original scenes, uncensored and uncut. Key Upgrades: High-definition Graphics — All of the in-game textures have been meticulously recreated in HD for mobile and desktop. Full Controller Support — Support for Sony and Microsoft controllers for desktop platforms. Live Graphics Comparison — Players can switch between the updated visuals and the original art assets with the touch of a button. SYSTEM REQUIREMENTS Windows	Operating System: Windows 7, Windows 8 CPU Processor: Intel Core i3, AMD A10 CPU Speed: 2.4GHz Memory: 4 GB RAM Hard Disk Space: 15 GB Video Card (ATI): Radeon HD 4450 Video Card (NVidia): Geforce 8800 Video Card (Intel): HD 4400 Video Memory (VRam): 512 MBSupported Gamepads: Microsoft Xbox 360 Games for Windows (Wired), Microsoft Xbox 360 Games for Windows Wireless Controller with Adapter, Logitech Wireless Gamepad F710, Logitech Gamepad F310, Razor Sabertooth – Gaming Controller for Xbox 360, Thrustmaster GPXLinux Operating System: SteamOS, Ubuntu 14.04 CPU Processor: Intel Core i3, AMD A10 CPU Speed: 2.4GHz Memory: 4 GB RAM Hard Disk Space: 15 GB Video Card (ATI): Radeon HD 5450 Video Card (NVidia): Geforce 260 Video Card (Intel): HD 4400 Video Memory (VRam): 896 MBSupported Gamepads: Microsoft Xbox 360 Controller for Windows (Wired), Microsoft Xbox 360 Games for Windows Wireless Controller with Adapter, & Logitech Wireless Gamepad F710Mac Operating System: 10.9.5 (Mavericks), 10.10 (Yosemite) CPU Processor: Intel Core i3 (2 cores) CPU Speed: 2.2GHz Memory: 4 GB RAM Hard Disk Space: 15 GB Video Card (ATI): Radeon HD 3870 Video Card (NVidia): Geforce 330M Video Card (Intel): HD 4000 Video Memory (VRam): 512 MB	Gamepad support: Fahrenheit: Indigo Prophecy Remastered supports the Playstation 4 Dualshock 4, the Playstation 3 Dualshock 3 Wireless Controllers and the Xbox 360 for Windows wired controller and the Xbox One controller (wired)	Other Requirements: Initial installation requires one-time Internet connection for Steam authentication; software installations required (included with the game) include Steam Client. Internet Connection and acceptance of Steam™ Subscriber Agreement required for activation. See www.steampowered.com/agreement for details NOTICE: The following video chipsets are unsupported for Fahrenheit: Indigo Prophecy Remastered: ATI Radeon X1000 series, HD 2000 series, 4670, 6490, 6630 NVIDIA GeForce 7000 Series, 8000 series, 9000 series, 320M, GT 100 series, Intel GMA series, HD 3000	NOTICE: This game is not supported on volumes formatted as Mac OS Extended (Case Sensitive) © 2015 Published and distributed by Aspyr Media, Inc. “Aspyr” and the Aspyr “star” logo are federally registered trademarks of Aspyr Media, Inc. Mac and the Mac logo are trademarks of Apple Computer, Inc., registered in the U.S. and other countries. The ratings icon is a trademark of the Entertainment Software Association. All other marks and trademarks are the property of their respective owners. All rights reserved.